At the Proxy Appliance step of the wizard, you can specify the proxy appliance settings. A proxy appliance is an auxiliary Linux-based instance. During the restore process, Veeam Backup & Replication uses the proxy appliance to upload disks of a backed-up machine to AWS. The proxy appliance is non-persistent. Veeam Backup & Replication automatically deploys the appliance in AWS only for the duration of the restore process and removes it immediately after that. The proxy appliance is required if you restore machines from backups located in external repositories or object storage repositories, and is recommended to use if you restore machines from backup repositories. Select the Use the proxy appliance check box. 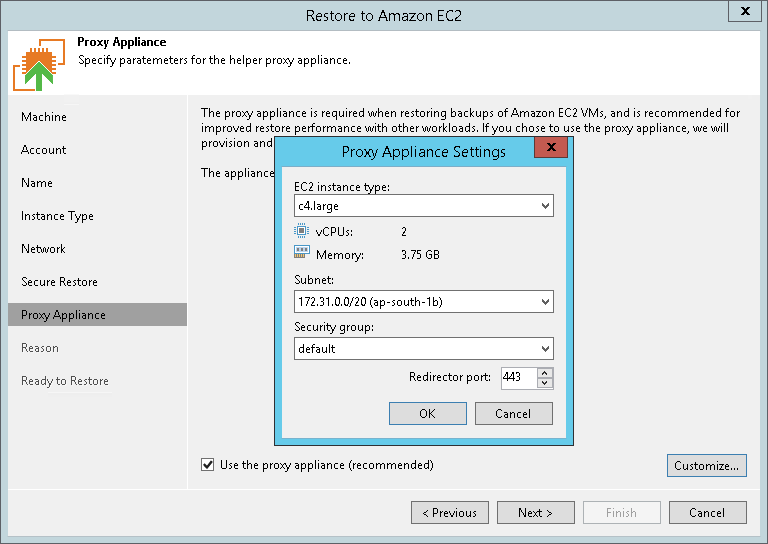 From the EC2 instance type list, select the instance type for the proxy appliance. To upload one machine disk to AWS, the proxy appliance requires 1 GB RAM. Make sure that the selected instance type offers enough memory resources to upload all machine disks. Otherwise, the restore process may fail. From the Subnet list, select the subnet for the proxy appliance. From the Security group list, select a security group that will be associated with the proxy appliance. In the Redirector port field, specify the port for routing requests between Veeam Backup & Replication components and the proxy appliance.